The most important part of roach control is accurately determining what species of roach it is. Coachroaches, also known as palmetto bugs or waterbugs, are very well known pests here in South Florida. They are one of the oldest groups of insects. There are over 3000 species in the world and over 50 in our country. They are not considered social insects, like ants and wasps. They prefer dark, warm, and moist habitats. Cockroaches range in color from light brown to black and can grow up to 2 inches in length. Roaches have ?at bodies that are oval in shape. Both male and females adults have wings, however they rarely fly. Females create oothecae, which are egg cases or capsules. These capsules contain 14 -16 eggs each. Females can produce 15-90 oothecae, one per week, in their lifetime. Cockroaches eat sweet, starching, and greasy foods. For this reason, they are frequent visitors in restaurants. However, they have been know to eat just about anything including; paper, cloth, books, leather, and other insects. They appear to prefer decaying matter and may carry disease. American cockroaches are a reddish brown color and have light/yellowish markings behind their heads. 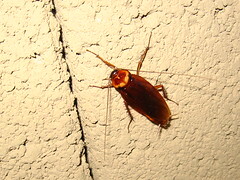 They are the biggest roaches that invade our homes and can grow to 1.5 to 2 inches in length. They prefer warm temperatures and usually live in moist areas. Their lifecycle is approximately 1-2 years and females can produce up to 150 offspring during their lifespan. German cockroaches are light brown to dark brown in color and have two streaks running parallel along their thorax. They are approximately .5 to .75 inch in length. German cockroaches are the most prevalent species around the home. They live in warm temperatures and are unable to colonize or survive in cold temperatures. Their lifecycle is appropriately 1.5 years. These roaches breed continuously and therefore generations may overlap one another. Once you know what species of cockroach you are dealing with you can make some simple adjustments in your environment to control the roaches. You can deter German cockroaches by limiting the amount of moisture but if you have American cockroaches you need to control both the temperature and the humidity or moisture level. One of the best things you can do to control roach populations is to make sure they have no water, shelter, or food available. Make certain the sink, and counter are cleaned every night. Clear out and clean all cabinets. Get rid of all crumbs, spilled foods etc. Keep food in sealable plastic tubs if possible and avoid open boxes. Do you have a roach control problem? Are you disgusted by your cockroaches, afraid to go into your kitchen, or turn on a light? Then pick up your phone and give us a call (561) 248-4546. We are experts in roach control. We eliminate your roach problems, and deliver peace of mind.